daudi baldrs and hildskjalf without all the casio. surprisingly its not terrible. Even though Varg's earlier ambient/keyboard albums are really good also, this is his best one yet. Something tells me Varg will not return to creating black metal again but that is OK because if he continues to improve in creating these ambient minimalistic albums, then the next one should be predicted as awesome! "Sol Austan, Mani Vestan" is an album totally focused on ambient and atmospheric sound, and this is how it should be seen and evaluated. It's not surprising that Varg would take his project to that path, since himself commented that after "Belus" he would return his vision to other musical concepts. Seen in this way, "Sol Austan, Mani Vestan" is a medium-sized album that presents a dry and moronic atmosphere, giving a feeling of being in a cold and silent game. 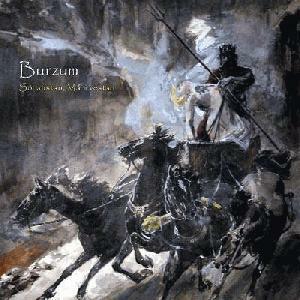 Nothing else, the album is just an acceptable complement to Burzum's discography. Some good ideas and strong moods are presented on a couple of tracks of this record, but the overly skeletal and uninteresting compositions of some other tracks and the seemingly endless repetition really drags this album down a lot for me. Yet another dark ambient record from Burzum. Luckily, this one isn't offensively bad like Umskiptar; rather, it's just boring. He has far better material in this style.